The differential is the same on a w1114, w115, w116, w123 and w126 (first generation) a first generation w126 diff will fit on a w114,but wont fit on a 1986 w126. If you are switching to a final drive from a v8 to a car without v8, you have to switch the yoke, and with that the “spacer washer”. or the other way around, from straight-engine to a v8 car. 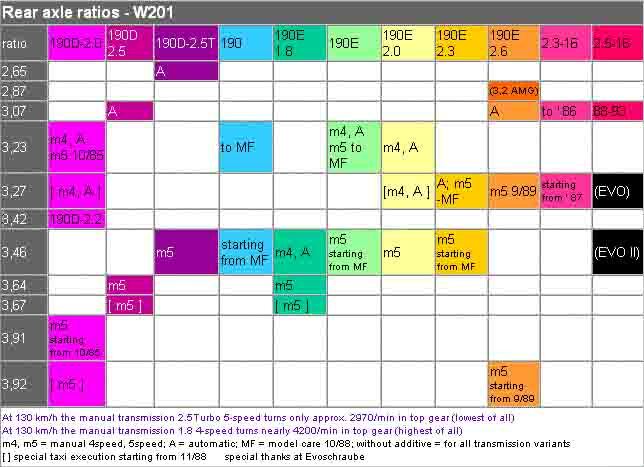 w124 – probably only automatics so far…. and probaby has some of them wrong to.. I am looking for the C240 diff ratio please. what i found a w203 c240 gasser with a sixspeed manual should have a diff-ratio of 3.46..
it should be easy for you to see under the car. Would you happen to know which differentials would fit as replacements for my 1996 S124 fitted with OM606.910 diesel engine, 722.4 auto box? Ratio is 3.07 but I haven’t found any reliable method to determine the dimensions or alternatives units. “al” w124 diffs will fit the chassi as far as i know, but do you want a different ratio, a bigger differential or something else? you need the correct driveshaft vs the differential type..
they have some different widths, and thus would require different driveshafts, The w124 open diff should be somewhere along 24cm and the ASD version has a width of about 28.5 if i recal correctly. il look into it closer when i get back home. I’m looking to put a 3.07/3.06 or other ratio in my W126 Gen I 1985 500 SEC. Can I simply swap the rack and pinion from any other Diff listed above as long as the final drive is 210mm? I’m specifically looking at a Rear Diff from a 1973-1980, 450 SL/SLC. Would the diff bolt up directly? Thanks! It will fit straight away, a v8 differential is the same no matter what car (up to 1985) so a 450sl will do just fine, you might need to keep your driveshafts, I’m not shure about the width of the r107 vs w126. Thanks for the reply! Great website. I will more than likely swap the internals as I’d like to maintain my ABS. I wont guareantee that will work, what internals to what house? Can I put a 4g-tronic auto gearbox from a w201 on a 1980 w123 with m102 engine? the thing you need to check is that you have the starter on the right side of the engine, if it has, then it will fit, how much work there is to get it to work i dont know, probably quite an upgrade from the stock w123 auto anyhow, got a w201 with the auto, and realy like it, was surpriced how good if felt compared to the many diesel autos ive driven (300tdt) althou that might be due to bad maintance on the diesels. i think the hardydiscs/flange is the same size, but do check the lenght of the gearbox, it might differ quite much. I think the naturally aspirated E300 Diesel w/OM606 have 3.07 final-drive ratio with automatic gearbox. Haven’t seen other ratios to this model. 300D Turbo, 300TD Turbo and E300 Turbodiesel with automatic transmission does all have the 2.65 ratio. and a 300SE w126 or w140? if the 300d is a w123 and the 300se is a w126 you wont gain anything by moving the diff, they have the same ratio and size, + the diff from a w126 300SE from 1986 or newer wont fit a w123. and the w126 gen2 diff (1986 or later) wont fit on a w124 either. does a w210 diff fit on a w124? The W111 diff’s are generally 4.08 on US cars, and 3.85 or 3.69 on Euros. The best diff to use is from the W108 280SE 4.5 which is a 3.27, however the housing is physically larger, due to the size of the crownwheel so you need to change the whole unit. These also have a cooling tube and therefore will not fit into a W113 unless you cut part of the floor support or modify the cooling tube. i am building a slc rally car and need lots of power from standstill. is it the higher the ratio the faster acceleration? i am thinking of 3.46 or even higher? 80s w123 diff will fit an 80s slc right? as long as the SLC was a straight cylinder car (280SLC) you wont have to swap the flange/yoke of the differential either. 1985 is the magic year that the differentials cant pass. regarding ratios, you are correct, the ratio is the amount of revs the driveshaft turns the ingoing axle to the diff, for the wheels to turn one revolution. 3.69 revolutions of the propshaft/driveshaft/cardanshaft whatever you choose to call it, will turn the wheels one rev. a 2.24 will thus be a lot faster at the same enginespeed and same gear in the gearbox. a 3.92 or 4.08 from a w115/w114 will fit to, but make shure you have rpm enought to not rev out the engine before you want to. 3.69 or lower, higher RPM or lower? the closest straight fit is a 3.46 from a 300SE, althou you need to swap the yoke/flange for the flexdisc since the v8 has a bigger one. thats the closest possible solution i can think of now, it will probably not be a straight fit, but might be doable. might be some measuring and fixes to get the bearings+cogs properly aligned. Finally after 2 years I fitted the 2.49 differential on my 1981 Mercedes 280E. It was a Jo doing it in the garage. I had to modify the hole on the subframe they were too far out. I measured and measured after the 12 time it fit. I had brought the CV axles new locally to get the lifetime warranty these had to be modified on the rotating parts that go in to the differential since they weren’t the can type axles. I took a little material off the end where the bolts fit and they rotated freely after that. I am waiting now on a front flex joint, transmission mount and center sleeve for the driveshaft after that I’ll be back to tell you more. So you will loose about 7% on the rpm. Simple put, anything lower will be lower, 2.65, 2.47 or whatever you might find. Linus, thank you for your insights. It seems then, the 84-85 500SEL with the 2.24 gear ratio would be the lowest. So can I assume a decrease from a 3.07 to a 2.24 would yield about a ~30% drop in RMP’s? yeah, that ought to be about it. What cruising speed is your goal? i have a w126 SEC with a om605 turbo and a 2.47, and since its a fivespeed i net out at about 1600rpm at 60mph, its a tad to low for those speeds, but 130-140km/h + its darn sweet. You dont gain much mileage by decreasing rpm to low. Yeah, but that increase in mpg isnt purely down to the RPM only, you have an exponential increase in airresistance with increased speed, you will drop a bit, but 1500rpm at 70mph wont match the consumption you get at 40mph at 1500rpm. hi,i’d like to change the m110 cab engine on my s280,which diesel or v8 engine will fit with few or no modifications pliz. 2.5 or something alike might very well be a very good option. the stock diff will probably sustain, but no, the gearing isnt the best. im not convinced that a w126/w123 subframe would be a easier swap than for example a bmw subframe. those might very well be easier to obtain, cheaper, and be better to build on. Finding good driveshafts and differentials from a w126 and w123 + finding good diff ratios to the old w123/w126 isnt that easy anylonger. Where BMW is a lot more common atleast in this part of the world. the w124 and w201 differntials isnt that durable, and often “sings” in my opinion. OK I hear you man. BMW, 2.5 ratio, but what model? 3, 5, 7? Clue me what to do. Are all ’85 300Ds equipped with the 2.88 ratio diff? I want to put that ratio into my ’84 300TD and I’ve found a guy parting out an ’85 300D. Is there a way to determine, before removal, if it’s the desired ratio? 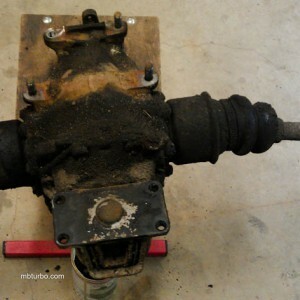 Althou you probably need to alter the driveshaft, and get a clutch+flywheel to match it. Any box would survive “normal” driving without a problem imo, but how do you plan to use it? Yes, the 2.82 differential i have was from a 500SE, those numbers are probably just serial numbers or something unimportant, dont put to much time on those since they dont acctualy matter that much. Since its a w126 diff from a v8 the yoke/flange will be bigger than what you have today and wont fit. are you going to swap the engine and driveline altogether or looking for a better ratio more suitable for todays trafic? Hi, great article! I’ve got a ’76 240D with a 4 speed manual. I found an ’80 300CD with what seems to be a strong engine, fairly clean. I’m planning an engine swap, my little 240 needs some more pep! I didn’t see listed a 1980 300CD on your list for what the final drive ratio would be..i’m assuming a 3.07? I figure I’ll swap both engine and rear diff, and keep my 4 speed manual. Doable? Thoughts? Thanks! Well, I didn’t realize the 300CD doesn’t have a turbo, so nevermind. I am looking for a 300TD to swap into my W115. Price has to be right! the 300CD ought to have a turbo, its a US/america specific car and nothing that came stock in europe atleast. But any stock 300CD c123 (w123) ought to be a turbo. ive lsiter 1982-1985, but might be wrong about that.